Biggest, longest, deepest, best—there are few places that offer foreigners as much as Vietnam. This long, slender country covers about the same area as New Mexico, yet stretches over 1,000 miles from north to south. Vietnam has more than 2,000 miles of coastline—more than any other country in mainland Southeast Asia. Remote white-sand beaches and quaint fishing villages beckon exploration. Vietnam offers much more than a beautiful coast. It’s also a mountainous country, with some of the loftiest peaks in the region. In the northwest, the tallest mountain in Indochina, Mount Fansipan, rises above the clouds at 10,312 feet. The peak was once only accessible to climbers, but the world’s longest and highest cable car now whisks visitors to the summit in less than 30 minutes. In northeast Vietnam, you’ll find the deepest canyon in Southeast Asia. Nearby are terraced rice paddies that cover steep and photogenic terrain. The multi-tiered Ban Gioc Waterfall separates China and Vietnam; it’s the fourth largest waterfall along any national border. This region’s Dong Van Plateau is the site of one of only two Global Geoparks in Southeast Asia. Hang Son Doong Cave and nearby Hang En are the largest and third largest caves in the world, respectively. Thousands of caves are scattered throughout the mountains and karsts of Vietnam. Many of them are accessible only by rowboat—a delightful activity to undertake on a sunny day. Picturesque rice paddies and hidden villages reward the explorer who travels the rural byways of Vietnam. The lowland jungles are warm and steamy year-round, while the mountainous north has four distinct seasons. There is even a small desert on the south-central coast, with cacti and sand dunes. Vietnam’s cities are as amazing as its geography. Capital city Hanoi has a population of more than 7 million. The city is a fascinating blend of ancient pagodas, sprawling parks, tranquil lakes, elegant French mansions, and modern conveniences. Densely populated and intensely energetic, the city feels alive—a fascinating place where busy residents pass their spare time socializing as they watch the world go by. 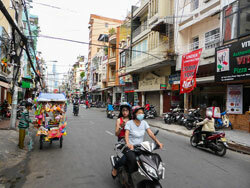 Ho Chi Minh City (Saigon) is Vietnam’s largest city, home to over 8 million people. It has an ultra-modern feel—a hub of commerce and development. Huge shopping malls, pedestrian-friendly walking streets, and plenty of museums give it a cosmopolitan flair. The modern, progressive city of Da Nang is home to one of the fastest-growing expat communities in Vietnam. It is located halfway between Hanoi and Ho Chi Minh City. 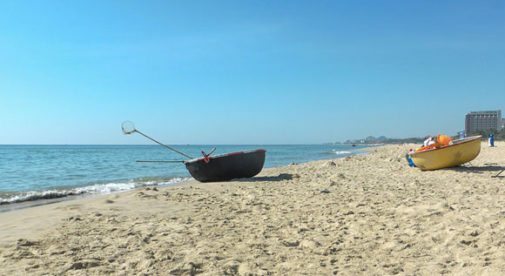 The city has some of the cleanest and prettiest beaches in Vietnam and two of the best golf courses in Southeast Asia. Laidback Da Nang is one of the most livable cities in Vietnam. Vietnam is widely regarded as having one of the world’s best food scenes. With influences from China, France, Japan, Thailand, and the U.S., modern Vietnamese cuisine reflects a fusion of cultures. Rich in seafood, meats, fruits, vegetables, and invigorating herbs, the Vietnamese diet is fresh and healthy. The Vietnamese people speak some of the best English in any Southeast Asian country, and enjoy practicing it whenever they get the chance. They tend to be very interested in learning about the world beyond their borders, and it’s common to be invited into someone’s home and treated like a respected and honored guest. It is not unusual for expats who have been in Vietnam for a while to find that more of their friends are Vietnamese rather than foreigners. Vietnam offers comfortable living at a budget practically anyone can afford. It’s yet another reason to consider making Vietnam your next home.